Dr. Niesluchowski earned her doctorate in psychology from the Chicago School of Professional Psychology in 2002. Previous to that, after earning a Master's degree in Counseling Psychology from Illinois State University, she worked as a substance abuse counselor in a community-based setting in Downstate Illinois and later in an intensive outpatient program on the West Side of Chicago. She also is a volunteer counselor and supervisor at the Chicago Women's Health Center, a feminist collectivist health organization that serves uninsured and underinsured women. Professional writing is a side interest, and she has served as a writing consultant to dissertation students. She is also an APA site visitor. Past clinical positions include the Institute for Human Resources in Pontiac, Illinois, and the Women's Treatment Center in Chicago. During her training, she was placed in a number of college counseling centers, including DePaul University, Northwestern University, University of Wisconsin-Madison, and Harper College, and college mental health continues to be an interest. Other clinical interests include women's issues, including identity, relationships, and reproductive issues, and feminist theory, therapy, training, and supervision. 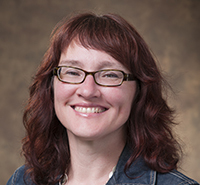 Her teaching interests include psychology of women, feminist theory, and psychodynamic therapy. She currently describes her theoretical orientation as a combination of self psychology and Relational Cultural Theory.